When we get a shipment of a new product, I typically keep one (sometimes two!) in personal collection. Draco was an exception: the distributor suddenly ran out, and the last one that I was going to keep for myself was requested by a long-time customer who I just didn't have the heart to refuse. Yes, we have M92s and M85s in stock! So this time as M92 and M85 pistols became available, I decided to shoot a couple of them right away, to make sure that Draco story does not repeat, and I can keep one in each caliber in my private collection. Just like Dracos, these are just another example of firearms industry working around the regulations. 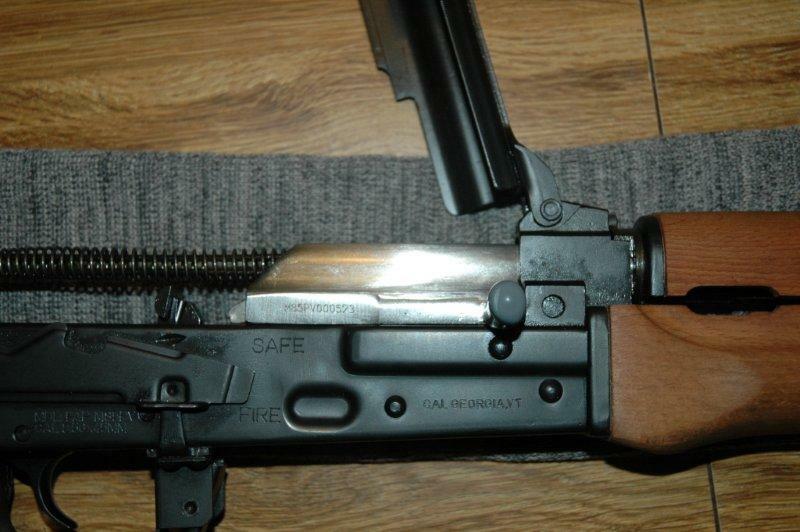 Originally they were developed for military use as short-barreled rifles (SBR) and had underfolder stocks. 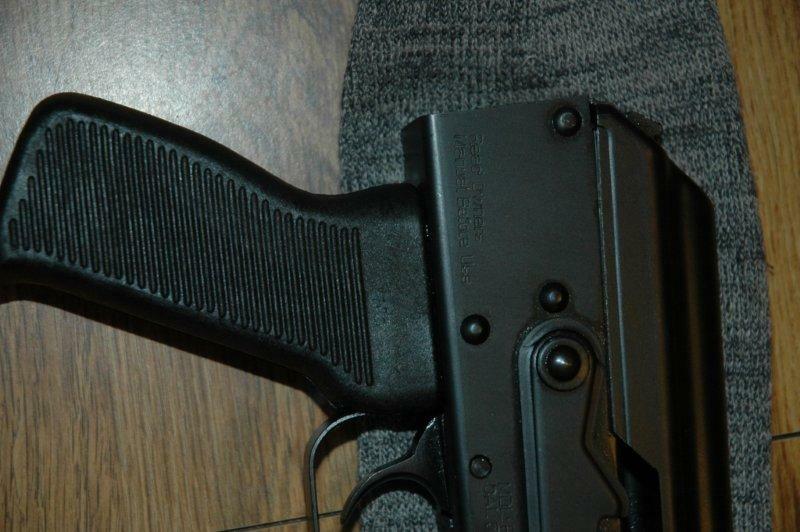 The "pistol" configuration has the stock removed. So because now these firearms have lost the capability of being fired from the shoulder, they qualify to be sold as pistols. This also means that 922(r) regulations are not applicable to them, so all parts, including the trigger group, are original. Hack or not, these pistols turned out to be a lot of fun to shoot. Here is the review. 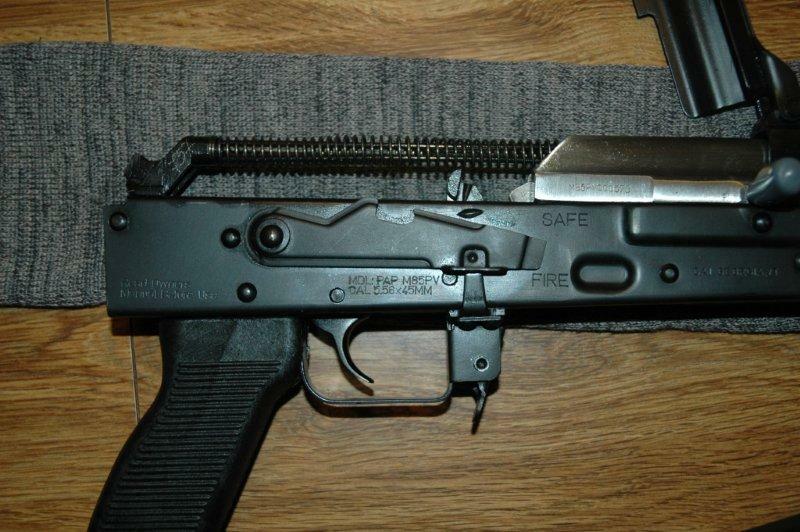 M85PV comes with a manual, a registration card, one plastic 223 magazine, and a full-length cleaning rod. 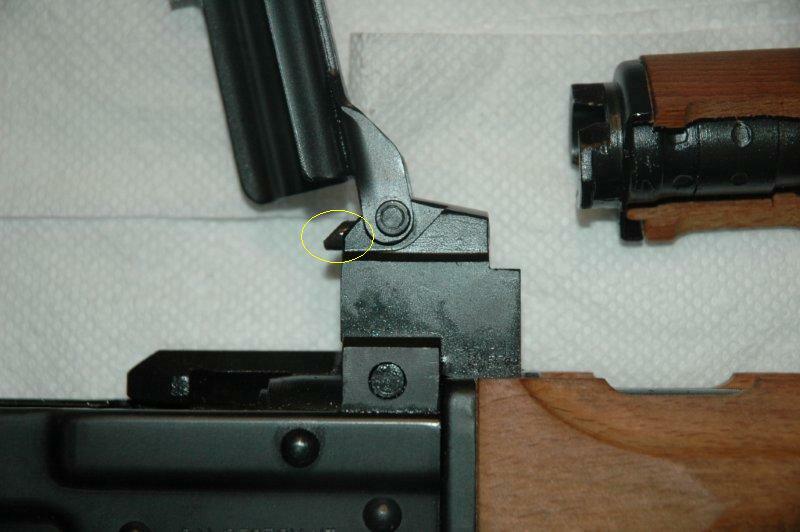 There is no bolt hold open function, so the bolt closes after the last round. M92PV has identical external appearance, except it uses regular AK-47 mags, and comes with two Yugo surplus mags with bolt hold open. The muzzle is protected by a circular muzzle guard that is screwed on, then spot-welded in one place. 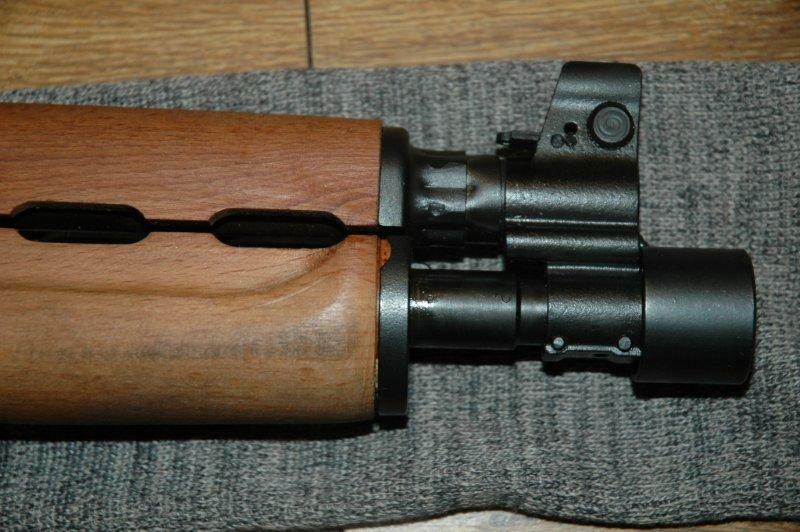 The weld can be easily removed and a normal AK muzzle brake can be installed in its place. The sight base is drilled for the spring-loaded locking pin. The handguards have what looks like a coat of stain over them, but the wood is otherwise unprotected. It should probably be treated further, either by linseed oil, or with a coat of laminate. Otherwise the dirt and dust imbed too easily. 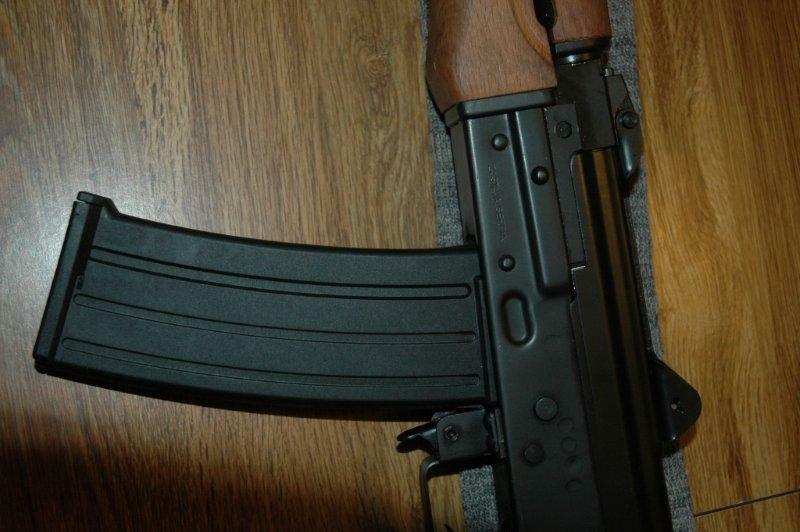 The action is just a familiar AK action. The pistol is charged by racking the bold handle backwards, and the handle reciprocates when the gun is fired. Keep your hands off it! There is no scope rail. This is very, very unfortunate. See below. The safety has a bolt hold open cut-out. If the lever is raised when the bolt is pulled back, the cut-out holds it in place. 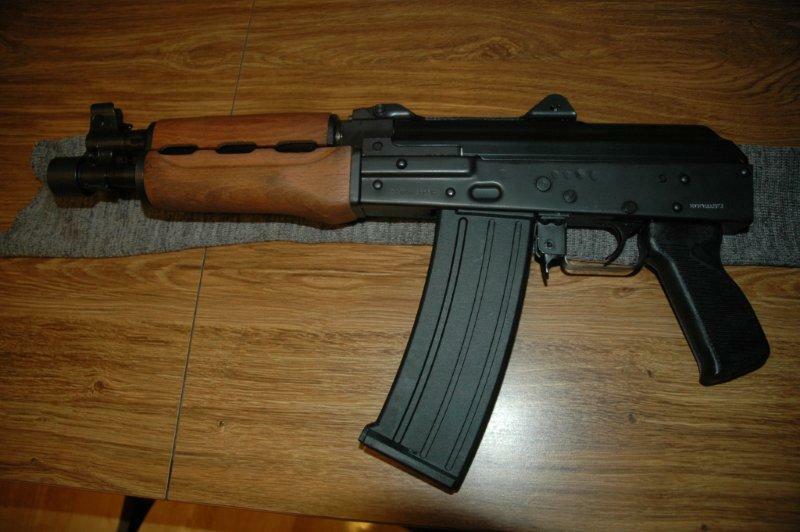 The grip is standard AK grip. There is, obviously, no stock since this is a pistol. 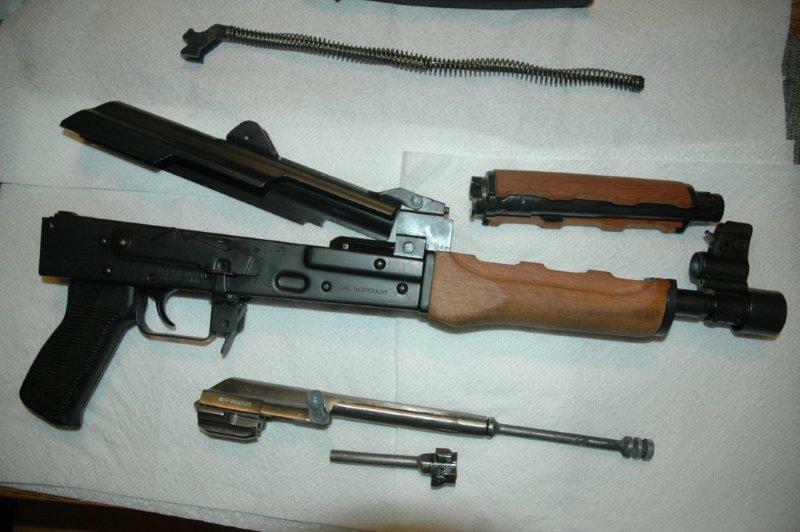 You could buy an underfolder stock kit on GunBroker, if you (a) do not live in WA, where SBRs are prohibited, and (b) are going to register it as an SBR and pay a $200 tax. The kit installation would require riveting. 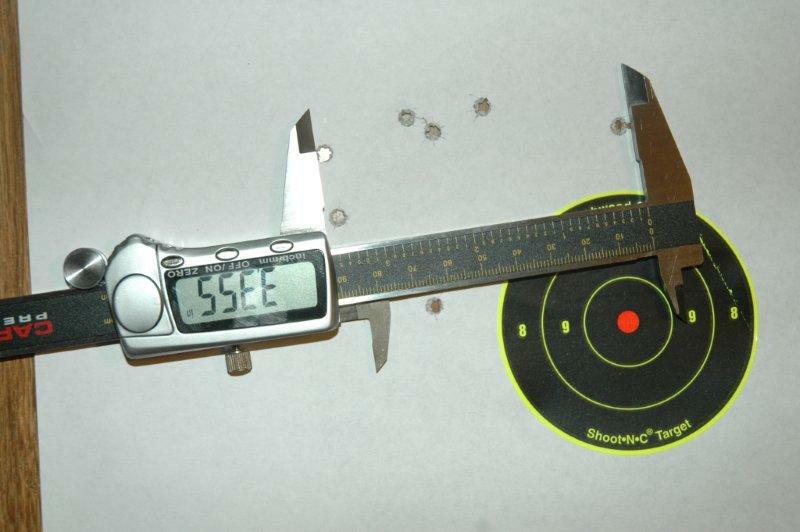 The biggest difference between M95PV and M92PV and Draco, as well as the rest of the AK platform, is the sights. Draco has normal AK sights. 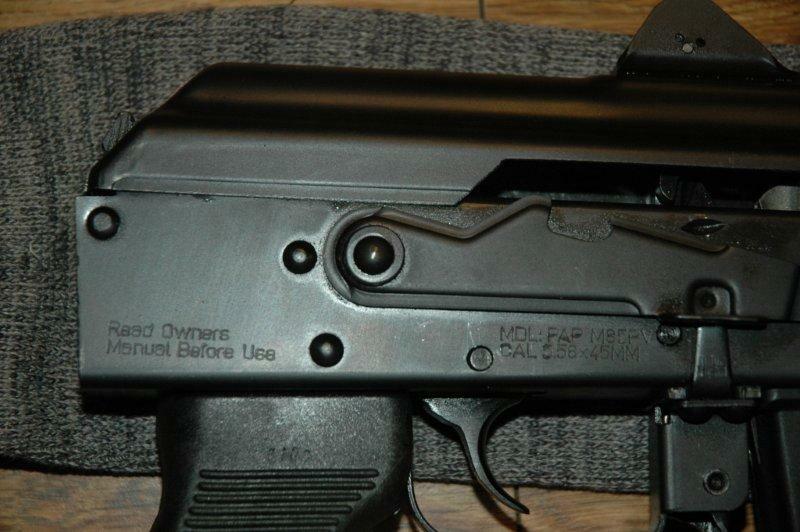 M85 and M92 have sights on top of the receiver cover, which itself is hinged on what would normally be the rear sight base. This gives the system stability and extends the sight radius. Normally I dislike dust-cover mounted sights, but in this case the construction is sturdy enough and zero seems to be quite stable. The sights themselves leave a lot to be desired. 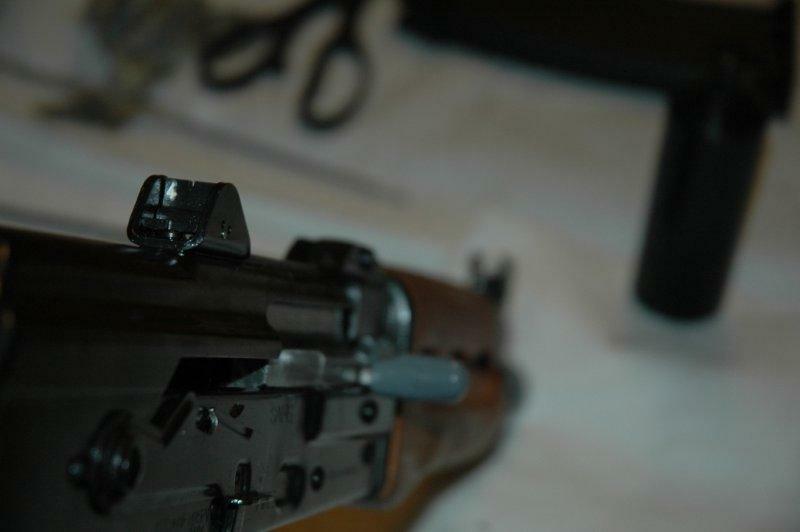 The front sight consists of a normal AK "pin" sight that can be screwed in and out to set a base zero. There is a flip-up dot sight for low visibility, which is not adjustable. This is the part of the firearm where manufacturing defects are rampant: out of 11 guns that went through my hands, two had problems. 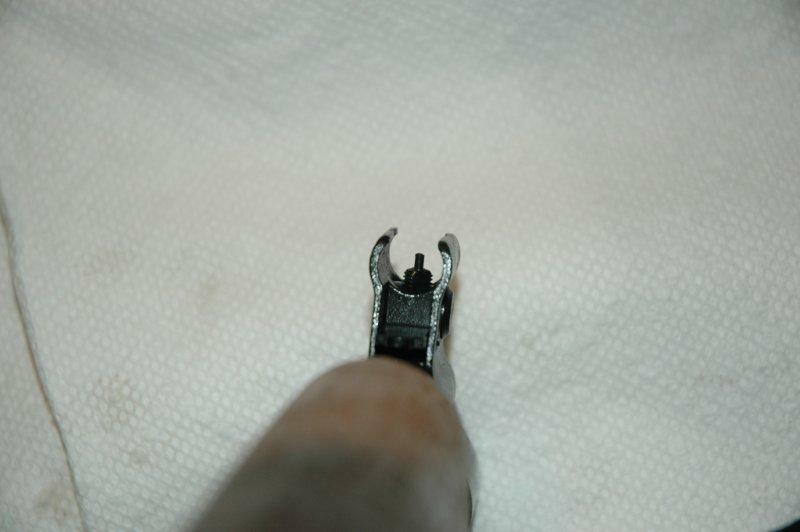 One came without the pin that secures the flip up sight blade in place, the other had problems with the spring-loaded detent mechanism, so the sight would pivot on a pin but would not lock in place in either raised or lowered position. 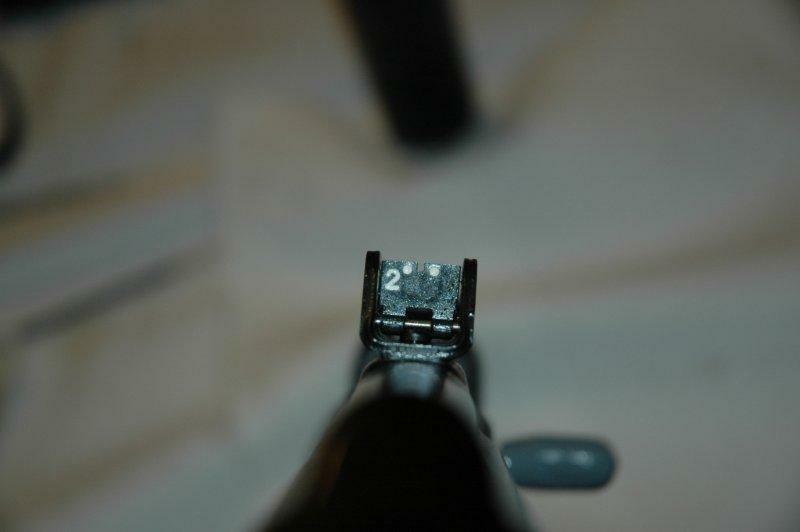 The rear sight is just a metal bracket that is held in place with a spring-loaded bal in two positions: 200m and 400m. The 200m has white dots for low visibility, the 400m is black. 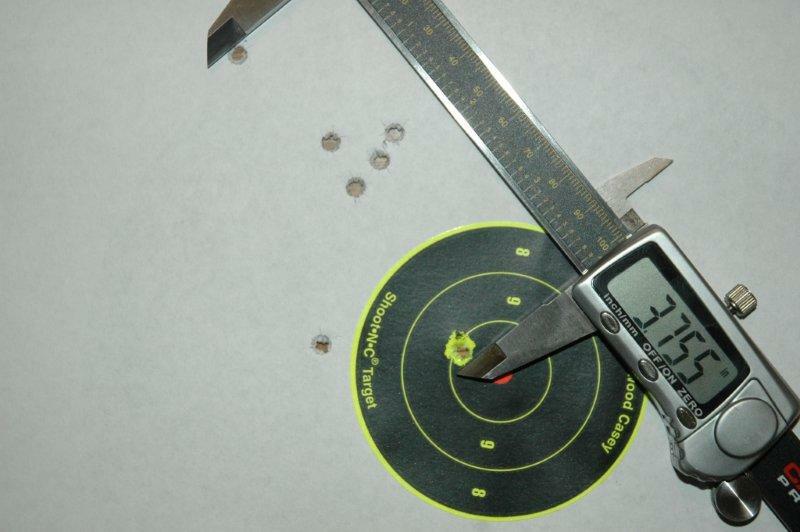 White paint actually interferes with the aimed fire (prevents the eye from focusing on correct sight picture), so I ended up shooting most of my test groups in 400m configuration. 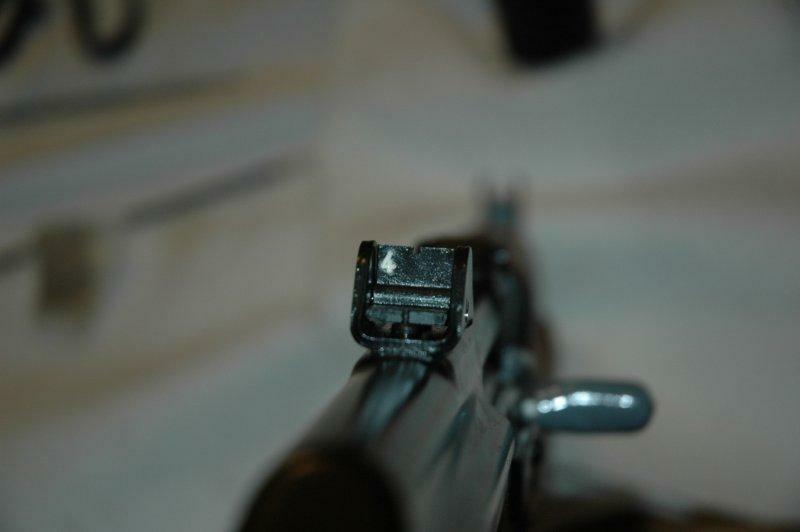 The notch on the sight is way too narrow, which also makes accurate aimed fire difficult. The basic sight configuration screams for a scope or a red dot sight (especially because the gun is actually super accurate - see below), but there is no siderail nor any other way to mount optics. This is very unfortunate, given that a tiny expense at the factory would have resulted in a much more useful and desirable weapon. 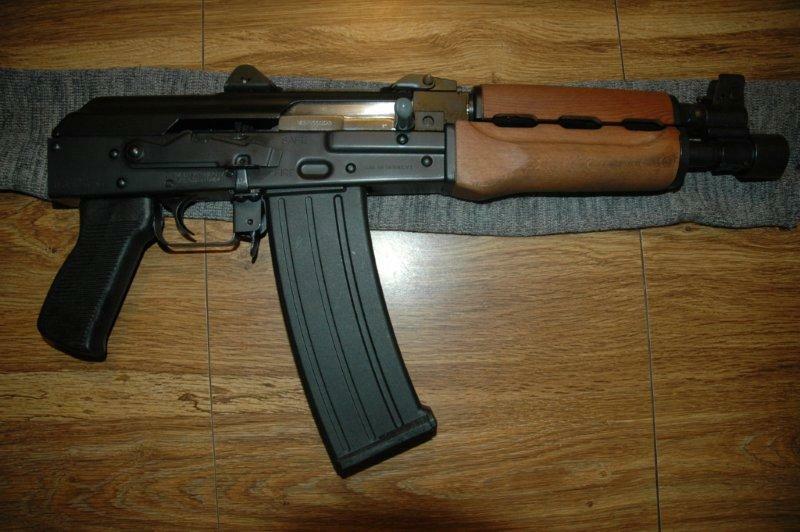 The pistol is almost an AK clone, and it comes apart very similarly to an AK. 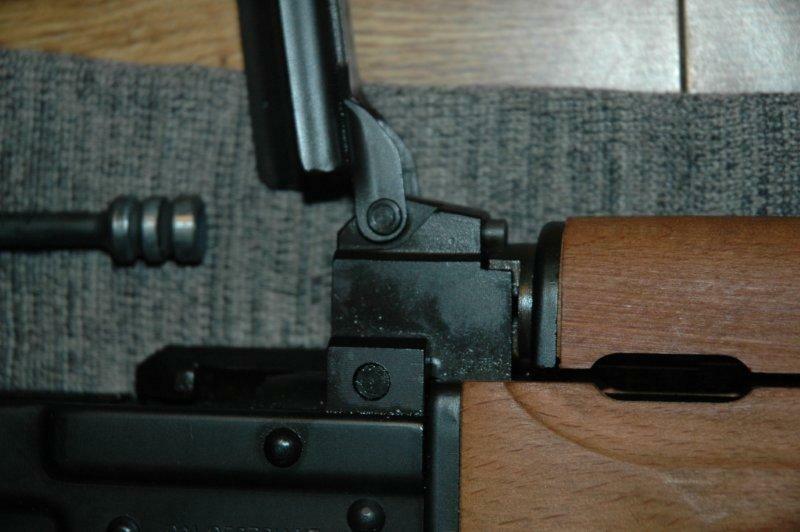 The only two differences are - the top cover is hinged on a pin that attaches to where a normal AK would have rear sight. 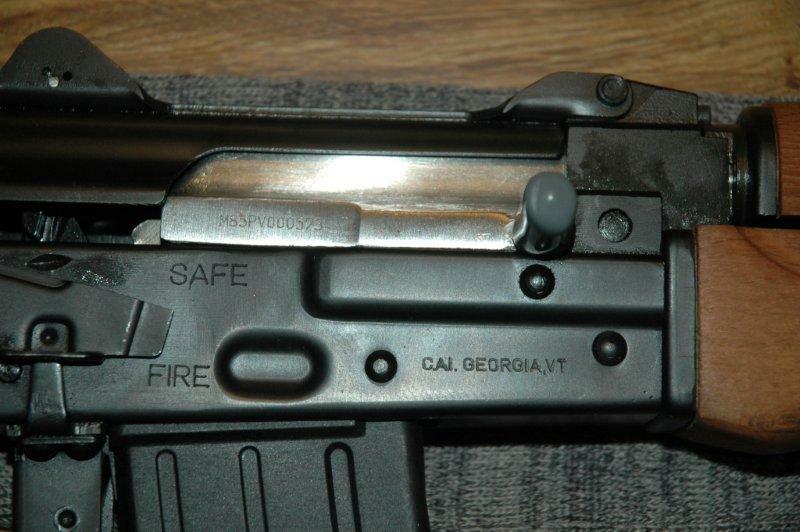 Also, the gas tube is held in place not via an AK-style latch mechanism, but using a pin that - when the dust cover is closed - is pushed forward to lock the gas tube in place. 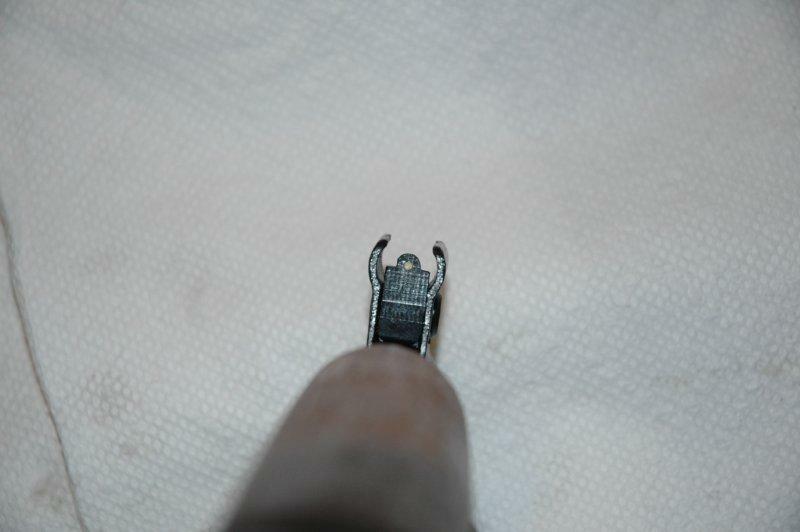 On some guns this pin is set too tight and needs to be lightly tapped out - from the gas tube side - to release the gas tube. The rest of the mechanism is the same as on a regular AK, and it disassembles into the same components. 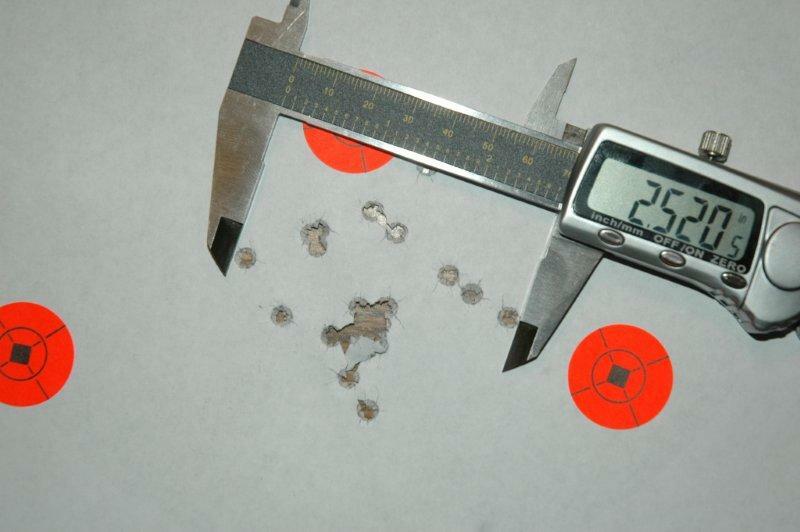 I started shooting from 25 yards from supported position using cheap Wolf 223 ammunition. The first couple of groups were just be getting used to the sights, and were OK at around 3.5", but nothing to write home about. 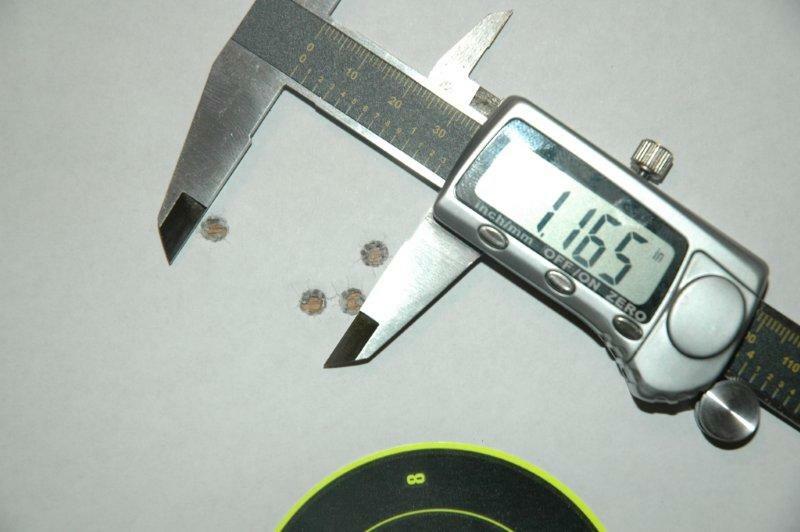 The muzzle blast from the 223 rounds was enormous, it was blowing spent cartridges off the table in front of the barrel, but the recoil was almost none. I then took it to a 10m distance and fired a few groups off-hand. The first few targets are not interesting because they were mostly me adjusting to the gun. The proper shooting position is where the hands are bent at the elbows. The left hand is right in front of the magazine, the right hand is holding it by the pistol grip. The position is similar to holding a rifle. 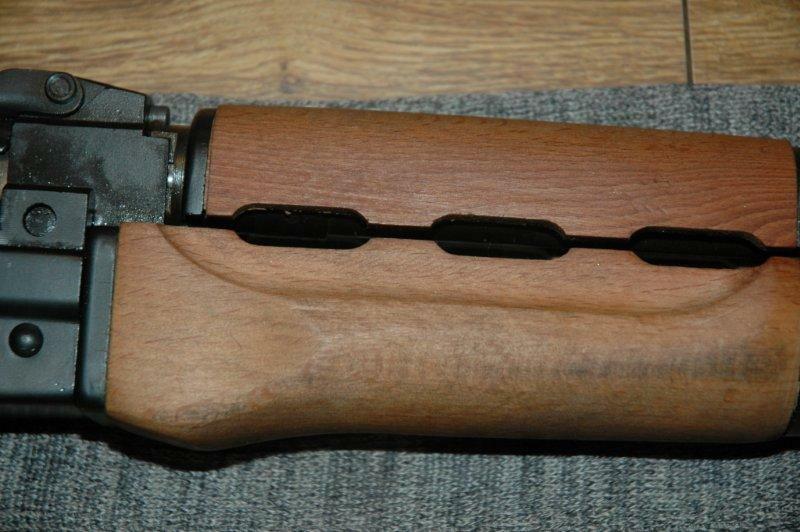 Normally in this position the stock would be necessary to absorb the recoil, but there is no recoil, so it works. 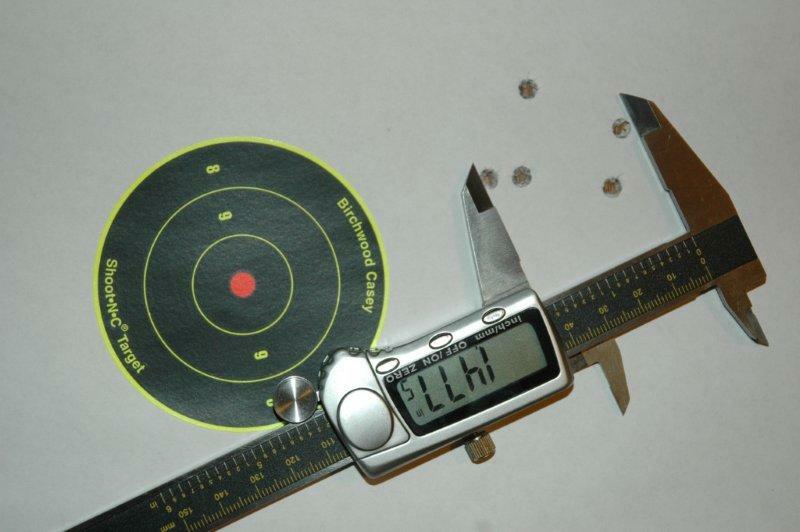 This is a magazine of Wolf 223 shot from 10 yards. It was getting fairly dark, but I wanted to try different ammunition, so I took the gun back to 25 yards, supported, and shot two groups of PMC rounds. While shooting the second group I have actually mistaken the sight guard for the sight blade once (it was getting REALLY dark), so the group only consisted of 4 rounds. I am fairly sure that given the right ammunition and better sights this gun will reliably shoot 1" 5-shot groups at 25 yards. M85 is a lot of fun to shoot. It has a very low recoil that allows firing it like you would an SBR, and its accuracy is top notch when compared to a pistol. I will certainly be keeping it!